and conductivity; density, potential density, and neutral density; speed of sound. Accuracy and Precision: accuracy is the ability to measure compared with an absolute standard, while precision is the ability to measure consistently within a given data set (variance in the measurement itself due to instrument noise). Generally the precision of oceanographic measurements is better than the accuracy. For each type of measurement below, current accuracy and precision expectations are listed. Units: officially we should be using mks units for everything. In reality, we often use cgs since our velocities are on the order of cm/sec rather than m/sec. We usually refer to depths in meters, and distances in kilometers. Most publications use decibars for pressure rather than Pascals. We usually use degrees Celsius rather than Kelvin, but care should be taken when doing heat calculations. Salinity officially has no units (see discussion below). In general be careful about units when doing calculations. Definition: Pressure is the force per unit area exerted by water (or air in the atmosphere) on either side of the unit area. Units: The units of force are (mass length / time2) which you can remember from Newton's Law F = ma. The units of pressure are (force / length2) or (mass /[length × time2]). mks: Newtons/m2 and 1 Pascal = 1 Newton/m^2. Atmospheric pressure is usually measured in bars. 1 bar = 106 dynes/cm2 = 105 Pascal. Ocean pressure is usually measured in decibars. 1 dbar = 10-1 bar = 105 dyne/cm2 = 104 Pascal. Description: The force due to pressure comes from the difference in pressure from one point to another - i.e. the "pressure gradient force" since the gradient is the change over distance. The force is in the direction from high to low pressure, hence we say the force is oriented "down the pressure gradient". In the ocean, the downward force of gravity is balanced mostly by an upward pressure gradient force. That is, the water is not accelerating downwards - instead it is kept from collapsing by the upward pressure gradient. Therefore pressure increases with increasing depth.The pressure at a given depth depends on the mass of water lying above that depth. (Hydrostatic equation given in class.) If the pressure change is 100 decibars (100 dbar), gravity g = 9.8 m/sec^2, and density is 1025 kg/m^3, then the depth change is 99.55 meter. The total vertical variation in pressure in the ocean is thus from near zero (surface) to 10,000 dbar (deepest). Horizontal pressure gradients drive the horizontal flows in the ocean (which are much much stronger than the vertical flows). The horizontal variation in pressure in the ocean is due entirely to variations in the mass distribution. Where the water column above a given depth (or rather geopotential surface, parallel to the geoid) is heavier because it is either heavier or thicker or both, the pressure will be greater. Note that the horizontal pressure differences which drive the ocean currents are on the order of a decibar over hundreds or thousands of kilometers, that is, much smaller than the change in pressure with depth. How is pressure measured? We measure pressure with a Quartz transducer, which has an accuracy of 3 dbar and precision of 0.5 dbar. 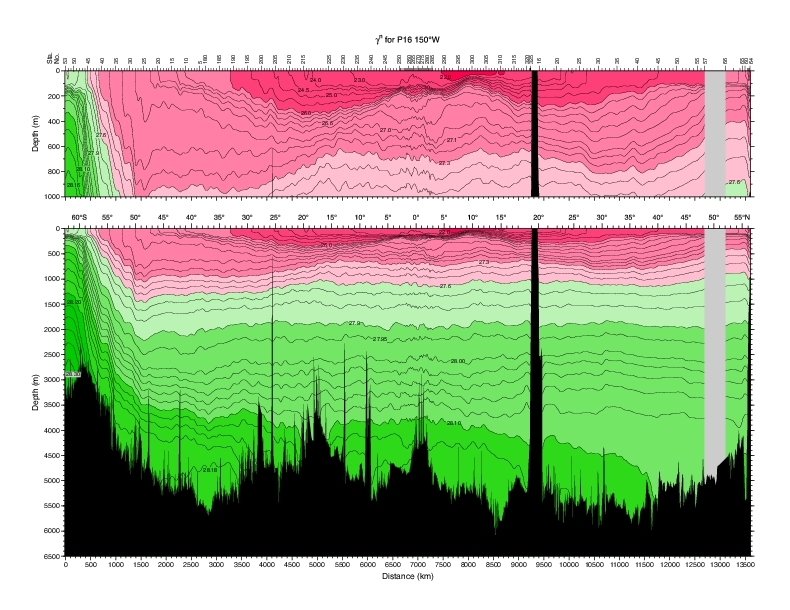 Click on the link to see the depth vs pressure profile calculated from a CTD cast near Japan. Definition: Temperature is a thermodynamic property of a fluid, and is due to the activity of molecules and atoms in the fluid. The more the activity (energy), the higher the temperature. Temperature is a measure of the heat content. Heat and temperature are related through the specific heat: (equation in class). When the heat content is zero (no activity), the temperature is absolute zero (on the Kelvin scale). Units: Temperature units used in oceanography are degrees Celsius. For heat content and heat transport calculations, the Kelvin scale for temperature should be used. In the special case when mass transport is zero across the area chosen for the heat transport calculation, degrees Celsius can of course be used. Most oceanographic applications of heat transport rely on making such a mass balance. (See discussion in topic 3). 0°C = 273.16 K. A change of 1°C is the same as a change of 1 K.
Using thermistors for electronic instruments, including replacement for reversing thermometer pairs. Quality varies significantly. The best thermistors commonly used in oceanographic instruments have and accuracy of 0.002°C and precision of 0.0005-0.001°C. Heat per unit volume is computed from temperature using Q = ρ × cp × T, where Q is heat/volume, ρ is the seawater density, cp is the specific heat, and T is temperature in Kelvin (when making a heat calculation in the ocean, where pressure is non-zero, use potential temperature as defined below.) mks units of heat are joules (i.e. an energy unit). Heat change is expressed in Watts (i.e. joules/sec). Heat flux is in Watts/meter2 (energy per second per unit area). To change the temperature by 1°C in a column of water which is 100 m thick and 1 m2 on the top and bottom, over a period of 30 days, requires what heat flux? The density of seawater is about 1025 kg/m3 and the specific heat is about 3850 J/(kg C). The heat flux into the volume must then be ρ × cp × ΔT × V/Δt, where T is temperature, V is the volume and t is time. This gives a heat change of 100 W. The heat flux through the surface area of 1m2 is thus 100 W/m2. Pressure in the ocean increases greatly downward. A parcel of water moving from one pressure to another will be compressed or expanded. When a parcel of water is compressed adiabatically, that is, without exchange of heat, its temperature increases. (This is true of any fluid or gas.) When a parcel is expanded adiabatically, its temperature decreases. The change in temperature which occurs solely due to compression or expansion is not of interest to us, as it does not represent a change in heat content of the fluid. Therefore if we wish to compare the temperature of water at one pressure with water at another pressure, we should remove this effect of adiabatic compression/expansion. Thus, "potential temperature" is the temperature which a water parcel has when moved adiabatically to another pressure. In the ocean, we commonly use the sea surface as our "reference" pressure for potential temperature - we compare the temperatures of parcels as if they have been moved, without mixing or diffusion, to the sea surface. Since pressure is lowest at the sea surface, potential temperature (computed at surface pressure) is ALWAYS lower than the actual temperature unless the water is lying at the sea surface. Definition: Salinity is roughly the number of grams of dissolved matter per kilogram of seawater. This was the original definition, and at one time salinity was determined by evaporating the water and weighing the residual. The dissolved matter in seawater affects its density (see section 5 below), hence the importance of measuring salinity. The "law" of constant proportions (Dittmar, 1884), formalized the observation that the composition of the dissolved matter in seawater does not vary much from place to place. Why constant proportions? Salts come from weathering of continents and deep-sea vents, etc - the input is very very slow (order 100,000 years) compared with the mixing rate of the whole ocean (which is order 1000 years). Thus it is possible to measure just one component of the dissolved material and then estimate the total amount of dissolved material (salinity). This approach was used until the 1950's. The main constituent of sea salt is Cl, the second largest is Na, followed by many other constituents (see Pickard and Emery for table). In actuality, there is a slight variation in the proportions, and recommendations are underway to formulate new definitions of salinity which depend on the actual constituents - this may likely take the form of geographically-dependent tables of corrections to the quantity which is measured (usually conductivity). The total amount of salt in the world oceans does not change except on the longest geological time scales. However, the salinity does change in response to freshwater inputs from rain and runoff, and freshwater removal through evaporation. Units: in the original definition, salinity units were ‰ (parts per thousand). This was replaced by the "practical salinity unit" or PSU. Most recently, the recommendation of the SCOR working group on salinity is that salinity be unitless, as the measurement is now based on conductivity and is not precisely related to the mass of dissolved material. Evaporate and weigh residual, determine amount of chlorine, bromine and iodine to give "chlorinity", through titration with silver nitrate. Then relate salinity to chlorinity, where S = 1.80655 Cl. Accuracy is 0.025 (less than 2 places). This method was used until the International Geophysical Year in 1957. Or, measure conductivity and relate it to salinity (see next). Definition: conductivity of sea water depends strongly on temperature, somewhat less strongly on salinity, and very weakly on pressure. If the temperature is measured, then conductivity can be used to determine the salinity. Salinity as computed through conductivity appears to be more closely related to the actual dissolved constituents than is chlorinity, and more independent of salt composition. Therefore temperature must be measured at the same time as conductivity, to remove the temperature effect and obtain salinity. Accuracy of salinity determined from conductivity: 0.003. Precision: 0.001. The accuracy is determined by the error caused by variations in constituents such as SiO2 which increase density but do not effect conductivity. How is conductivity for calculating salinity measured? For a seawater sample in the laboratory, an "autosalinometer" is used, which gives the ratio of conductivity of the seawater sample to a standard solution. The standard seawater solutions are either seawater from a particular place, or a standard KCl solution made in the laboratory. The latter provides greater accuracy and has recently become the standard. Because of the strong dependence of conductivity on temperature, the measurements must be carried out in carefully temperature-controlled conditions. From an electronic instrument in the water, either inductive or capacitance cells are used, depending on the instrument manufacturer. Temperature must also be measured, from a thermistor mounted close to the conductivity sensor. Calibration procedures include matching the temperature and conductivity sensor responses. For mapping general circulation, it is more useful to use density (hereafter ρ) as our vertical coordinate than pressure since we assume that water parcels much more nearly conserve density than pressure. Thus we often map properties on isopycnal surfaces. However, the isopycnals which we choose must have the effect of changing pressure removed since most of the density variation in the ocean is due to pressure, which has no bearing on sources of heat/salt for water parcels. Thus we introduce the concept of potential density or neutral surfaces, which attempt to remove the effect of pressure changes on density. Definition: Seawater density depends on temperature, salinity and pressure. Colder water is denser. Saltier water is denser. High pressure increases density. The dependence is nonlinear. An empirical equation of state is used, based on very careful laboratory measurements (See Gill, Appendix 3). The density of freshwater is 1000 kg/m3. Typical densities for seawater are only slightly higher: 1020 to 1050 kg/m3, with most of this range being due to pressure. The range of densities at the sea surface is about 1020 to 1029 kg/m3. Density as a function of temperature for pure and salty water: Fresh water (S=0) at atmospheric pressure (p=0) has maximum density at temperature 4°C. (Thus colder fresh water is less dense, which has implications for lake overturn and ice floating.) As salinity is increased, the density maximum moves to lower temperature. At a salinity of about 24.7, the maximum density is at the freezing point. Density at pressure 0 dbar as a function of temperature and salinity for low salinity: figure show the locus of maximum density and the freezing point. The maximum density curve should be smooth - bumpy because maxima were calculated from a discrete grid with no interpolation. Density at pressure 0 dbar as a function of temperature and salinity. The non-linearity of the equation of state is apparent in contours of constant density in the plane of temperature and salinity (at constant pressure) - they are curved. They are concave towards higher salinity and lower temperature. ɑ (specific volume) = 1/ρ. Seawater is compressible, although not as compressible as a gas. As a water parcel compresses, the molecules are crushed together and the density increases. (At the same time, and for a completely different reason, compression causes the temperature to increase which very slightly offsets the density increase due to compression. )Most variation in seawater is caused by pressure variation. This has little to do with the source of water, and if we wish to trace a water parcel from one place to another, one depth to another, we prefer to remove the pressure dependence. (This is in analogy with potential temperature). Figure (top right). Increase in density with pressure. Potential density is defined as the density a parcel has when moved adiabatically to a reference pressure. If the reference pressure is the sea surface, then we compute the potential temperature of the parcel, and evaluate the density at pressure 0 dbar. But, cold water is more compressible than warm water. That is, it is easier to deform a cold parcel than a warm parcel. Therefore cold water becomes denser than warm water when they are both submerged to the same pressure. Therefore it is necessary to use a reference pressure which is relatively close to the depth we are interested in studying. The compressibility effect is apparent when we look at contours of density at say 4000 dbar compared with those at 0 dbar. Figure. Potential density relative to 0 and 4000 dbar as a function of temperature and salinity. We refer to potential density at the sea surface as "sigma sub theta", if potential temperature is used ("sigma sub t" if measured temperature is used: an outdated method). We refer to potential density referenced to 1000 dbar as "sigma sub 1", to 2000 dbar as "sigma sub 2", to 3000 dbar as "sigma sub 3" and so on, following the nomenclature introduced by Lynn and Reid (1973). In these cases, potential temperature relative to the reference pressure is used in evaluating the potential density. The dependence of compressibility on temperature can be important. For instance, water spilling out of the Mediterranean through the Strait of Gibraltar is extremely salty and rather warm, compared with water spilling into the Atlantic from the Greenland Sea over the Greenland-Iceland ridge. They both have about the same density at their sills. However, the warm, saline Mediterranean water does not compress as well as the Greenland Sea water, and does not reach the ocean bottom (there is also a difference in how the two types of water entrain other waters as they plunge downwards, so this is not a straightforward explanation). Neutral density: when analyzing properties in the ocean to determine where water parcels originated, it is assumed that most motion occurs with very little change in the density of the parcel, with the exception of changes due to pressure. This concept is essentially a statement that water follows an isentropic surface if it moves with no exchange of heat and salt. Defining an isentropic surface in the presence of mixing presents some difficulties. The isopycnal surfaces which we use in practice to map and trace water parcels should approximate isentropic surfaces. We typically use a reference pressure for the density which is within about 500 meters of the pressure of interest. (This pressure interval has just been found through experience to be adequate.) Therefore when working in the top 500 meters, we use a surface reference pressure. When working at 500 to 1500 meters, we use a reference pressure of 1000 dbar, etc. This discretization takes care of most of the problems associated with the effect of pressure on density. When isopycnals cover a greater range of pressure, then they must be patched into the shallower or deeper range - this is the practice followed by Reid in his various monographs on Pacific and Atlantic circulation. Ivers (1976), working with Reid, introduced a more continuously varying reference pressure for isopycnal surfaces, which he then referred to as a "neutral surface". If a parcel is followed along its path, assuming the path is known, then it is possible to track its pressure continuously and continuously adjust its reference pressure and density. McDougall (1987) refined the neutral surface concept and Jackett and McDougall (1997) have released a computer program and lookup table for computing neutral density. Neutral density depends on location in latitude/longitude/depth and is based on marching outwards around the world from a single point in the middle of the Pacific, using a climatological temperature/salinity data set, and tracking imaginary parcels along radiating lines. Initial usage indicates that neutral density as determined from this program can successfully replace the approximate neutral surfaces produced by adjusting reference pressures every 1000 dbar. The speed of sound in water is approximately 1500 m/s. It depends on pressure and on temperature. The higher the pressure, the higher the sound speed (in a sense, the water is more "rigid" and so the speed increases). The higher the temperature, the higher the sound speed. In most areas of the ocean, the warm water at the surface and the high pressure at the bottom produce a sound speed profile which is maximum at the surface and bottom, with a minimum in between. This sound speed minimum is referred to as the SOFAR channel. Where temperature is low or inverted near the surface, then there is no surface maximum in sound speed and the SOFAR channel is found at the sea surface (typical of the subpolar and polar regions). Where there is a sound speed minimum, it functions as a wave guide. Figure. 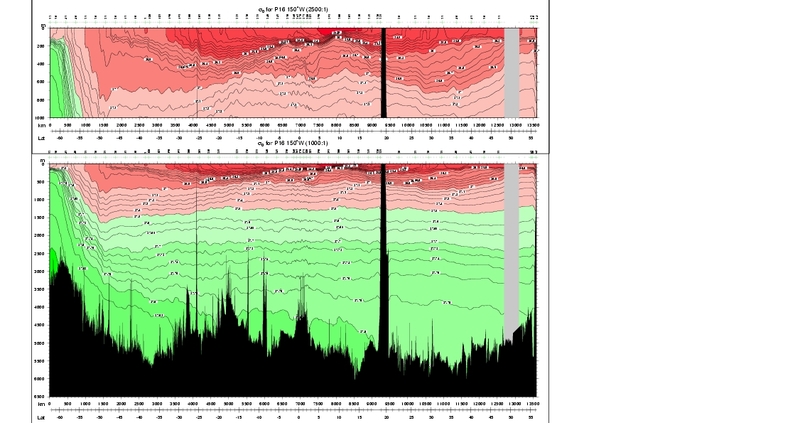 Profiles of potential density, Brunt-Väisälä frequency, potential temperature, sound speed from the eastern subtropical North Pacific. The freezing point of seawater is lower than that of freshwater. As sea water freezes, it forms pockets of salt. The salt (brine) leaches out of the bottom of the ice and the brine drips into the water below the ice. Thus sea ice when melted is considerably fresher than the original water which was frozen. The "brine rejection" process creates dense water below the sea ice formation area. This can be an important contributor to dense water formation in a global sense as the densest waters are formed at high latitudes, and often involve sea ice. The faster that sea ice is frozen, the less likely that the salt can escape. Thus the saltiest sea ice is formed at the lowest temperatures. Sverdrup et al. (1942 text) tabulate the salinity of ice formed from water which starts at salinity 30. When frozen at an air temperature of -16C, the salinity of the ice is 5.6. When frozen at an air temperature of -40C, the salinity of the ice is 10.2. Figure (bottom right panel). Freezing point temperature as a function of salinity. What properties of seawater determine its density? What is the pressure at the bottom of the ocean relative to sea surface pressure? What unit of pressure is very similar to 1 meter? What are the two effects of adiabatic compression on density? What quantity is used to minimize the effect of compression on density? Is cold water more or less compressible than warm water? What is salinity and why do we use a single chemical constituent (which one?) to determine it? What other physical property of seawater i is used to determine salinity? What are the problems with both of these methods? What is an equation of state? What unique properties of seawater arise from non-linearities in the equation of state? What is a neutral surface or path? What are the significant differences between freezing pure water and freezing seawater? What happens to the salt in frozen seawater? Fresh water has a density maximum at a temperature above the freezing point, which allows ice to float. Is this also true for sea water? Why does ice formed from sea water float? Why is there a sound speed minimum in the middle of the water column? If the travel time between source and receiver is 56 minutes and 28.25 seconds, what is the mean temperature of the water? Suppose the water between the sound source and receiver were to warm by 0.15°C. What would be the change in the acoustic travel time? Suppose, instead, that a warm eddy drifted into the sound path. 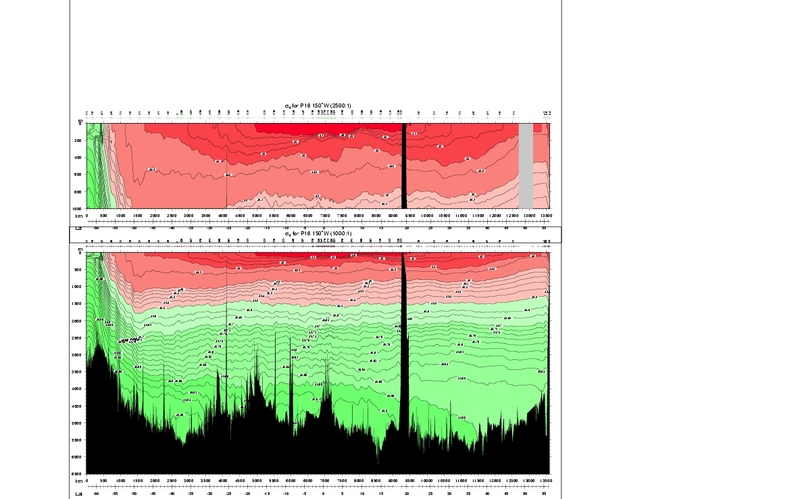 The eddy has a width of 200 km and a temperature anomaly of 1°C at 1000m. What is the change in acoustic travel time?A 5m deep swimming pool is filled with seawater so that the level is 1 cm below the rim (e.g. 4.99 m of water). If the water is well mixed and initially at 10C and 35 PSU. If the water is uniformly heated, how hot would the water be when it started leaking over the rim? How much heat (J/m2) is required to heat the water to this point? If the heating rate is 100 W/m2, how long would this take? Fofonoff, N.P., 1985. Physical properties of seawater. J. Geophys. Res., 90, 3332-3342. Mantyla, A., 1987. Standard seawater comparisons updated. J. Phys. Oceanogr., 17, 543-548. Montgomery, R.B., 1937. A suggested method for representing gradient flow in isentropic surfaces. Bull. Amer. Met. Soc., 18, 210-212. Jackett, D. and T. J. McDougall (1997). A neutral density variable for the world's oceans.